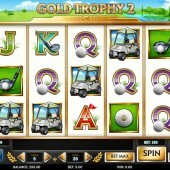 Avid fans of the exciting Gold Trophy slot rejoice, they’ve only gone and released a sequel! As if hitting free spins and Wilds that offer impressive multipliers wasn’t enough, slot developer Play’n Go has decided that a second installment of the popular golf-themed slot was necessary. Like Gold Trophy... But Better! 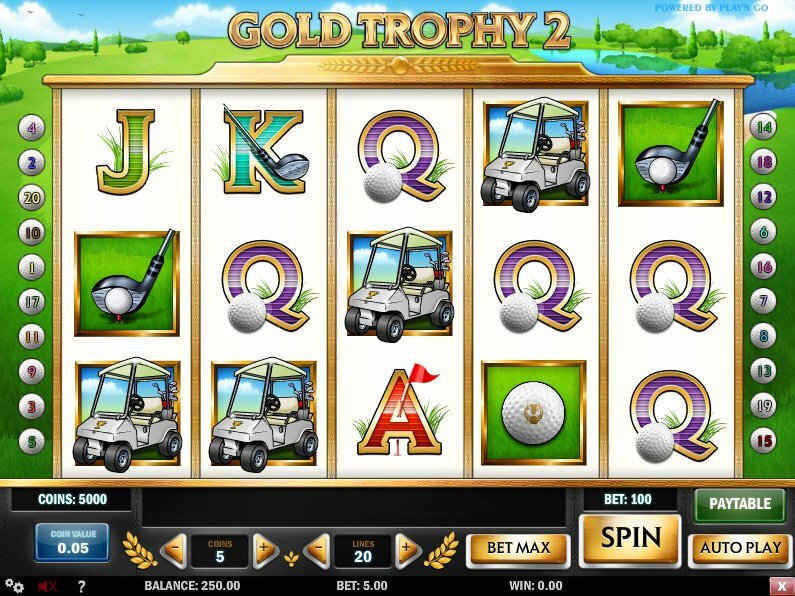 Gold Trophy 2 is a 5 reel, 20 pay-line slot that feels like it genuinely is taking the cult hit Gold Trophy to a more commercial level. 11 pay-lines have been added and it just feels like The Empire Strikes Back felt after Star Wars. It has a bigger budget, more awareness of what the people want and just an all round more impressive slot. You would even think George Lucas himself was behind this release! You will immediately notice that the graphics are slicker. The symbols are not too different from the original. There are still the golf balls, prize checks, golf carts and other golf-related paraphernalia symbols on the reels with the regular 9 through to Ace symbols donned with golf clubs, golf balls and flags. The Gold Trophy is Still Wild! The Wild remains as the gold trophy symbol and continues to substitute for all other symbols except for the Scatters to complete winning combinations and give you the chance to win some big prizes. Find the Prize Checks and Win up to 60 Free Spins! The prize check symbols are once again used as the Scatters and on top of paying out 200x your line bet they are also key in triggering the free spins bonus round on this slot. On Gold Trophy, these triggered the Pick a Check Bonus where you got to choose up to 25 free spins but this is a set free spins bonus round where you can trigger 15 free spins with a 3x multiplier. No, it’s not 25 free spins but the free spins can be re-triggered up to three times giving you the opportunity to win up to 60 free spins so it is not all bad. Gold Trophy 2 is not too different to its predecessor. The quality of the graphics and gameplay just feels smoother and it does seem like it is more of a re-boot than a sequel. This is a great slot to check out if you loved the original but also if you have enjoyed playing other sport-themed slots such as Playtech’s Top Trumps Football Legends.